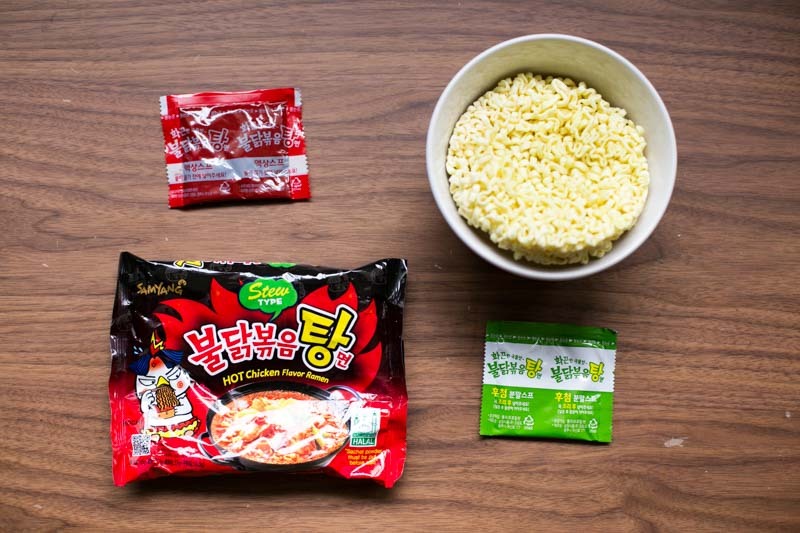 The Korean Spicy Noodles brand, Samyang, has taken Asia by storm and we’ve decided to ride the Hallyu wave too. 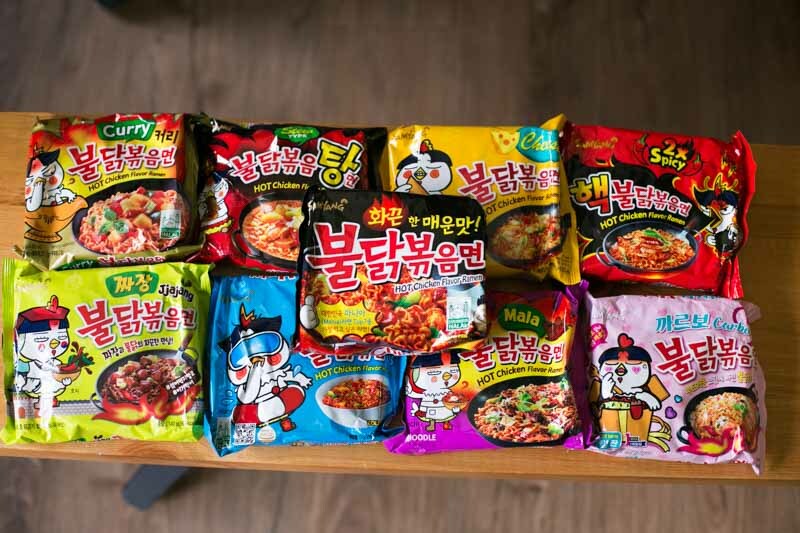 We fished out one of each flavour, including the latest addition to the spicy noodle family – Jja Jang Myeon, or Zha Jiang Mian as we know it in Mandarin. We braced our stomachs (and tongues) to try them all out, so here’s how they fared against one another. Of course, we had to start with the basics to warm up (quite literally) with. Apart from the spicy sauce, the Original Hot Chicken Flavour Ramen ($6.90) came with the sesame seeds and seaweed flakes too. The spice level was alright for starters, and I could see myself eating this for lunch occasionally. 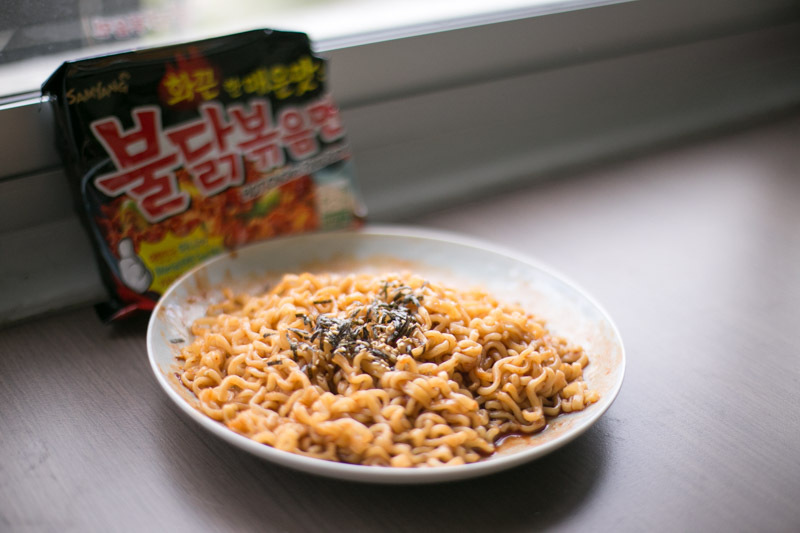 Though it wasn’t too special, the signature Samyang chicken flavour came right through. Next, we levelled up and went for the 2x Spicy Hot Chicken Flavour ($6.90). The oozing bright red sauce really intimidated some of us at the office, but we refused to chicken out. Everything seemed fine during the first few seconds from my first bite, but then it started to kick in. I would say that the burn crept in slowly but exponentially, and before I knew it, it worked up quite a fire in my mouth. And this is coming from a person who chooses da la (very spicy) when she eats Mala hotpots, so proceed with caution for this one. One of my colleagues couldn’t stop herself from taking bite after bite, even after the repeated “are you sure?” from the rest of us. But needless to say, a few minutes later we all found her on the couch with two ice cubes in her mouth to ease her burning tongue. Well, I guess what they say about getting hurt by the things you love the most is true after all. 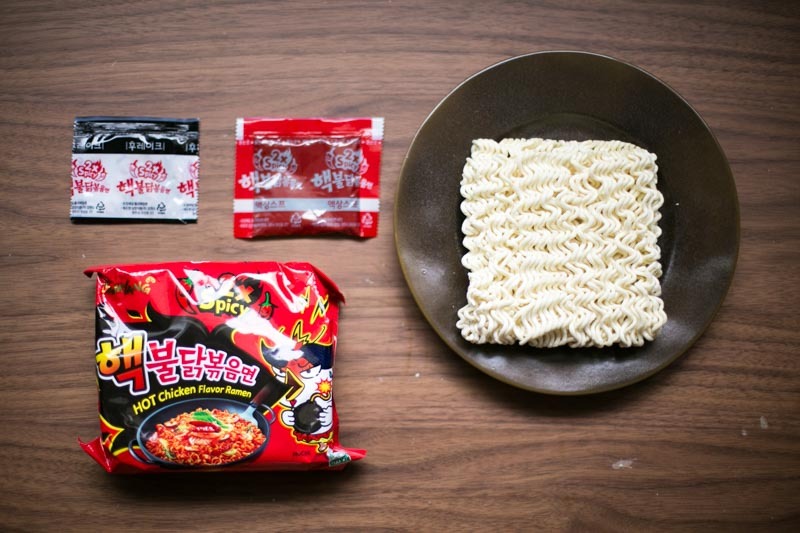 At a whopping $4.50 for an individual packet, the Jja Jang Myeon Hot Chicken Flavour Ramen ($4.50) was the most expensive flavour amongst its other spicy counterparts. We were all trying this for the first time because it’s a newly dropped flavour in Singapore, so perhaps that explains the priciness of it. 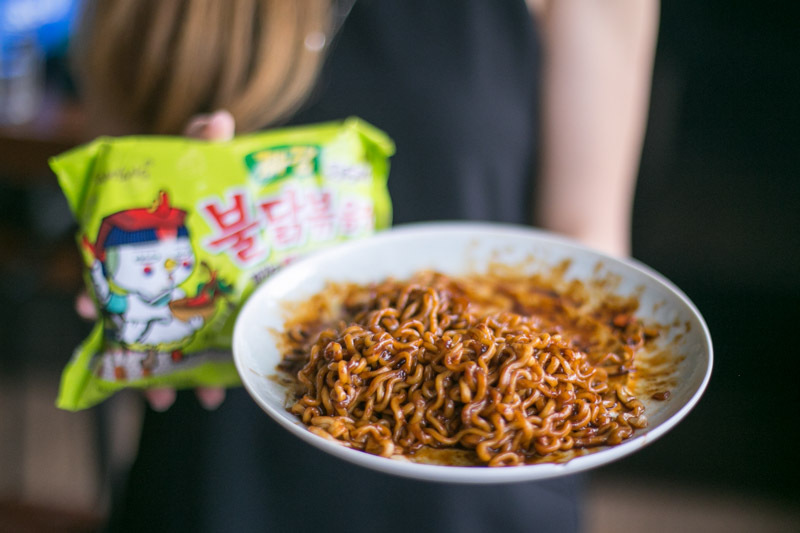 We fell in love with it instantly because of its addictive Jja Jang flavours, and my colleague even said that this became her new favourite flavour right away. 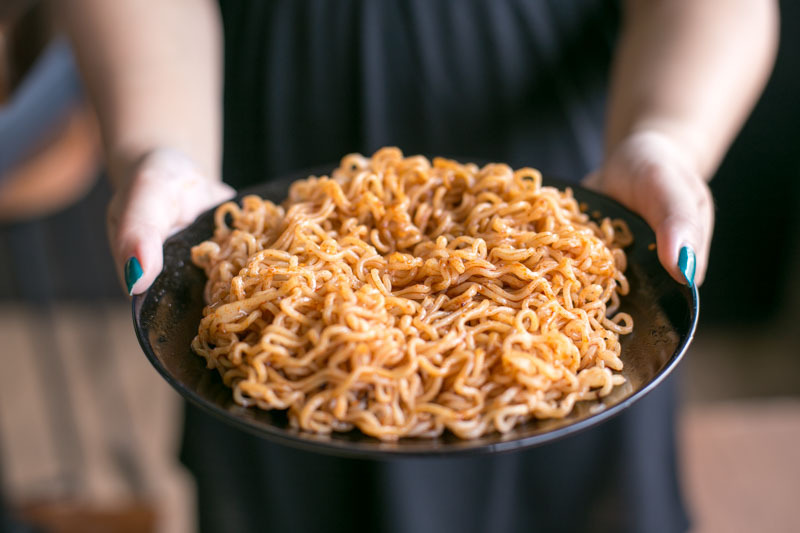 The texture of the noodles had the right amount of springiness (if you cook it well), which made each bite a joy to take. This definitely made it to one of my top favourites too. 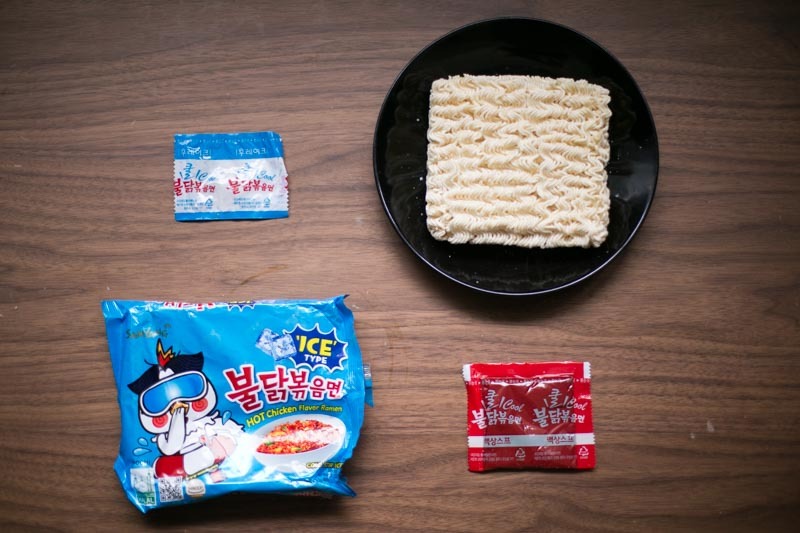 The Ice Type Hot Chicken Flavour ($6.90) was the most interesting one because you hardly see instant noodles meant to be eaten cold. Quite frankly, it was kind of a hassle to prepare, and it’s not something I’d go for if I’m looking for a quick fix for my rumbling tummy. 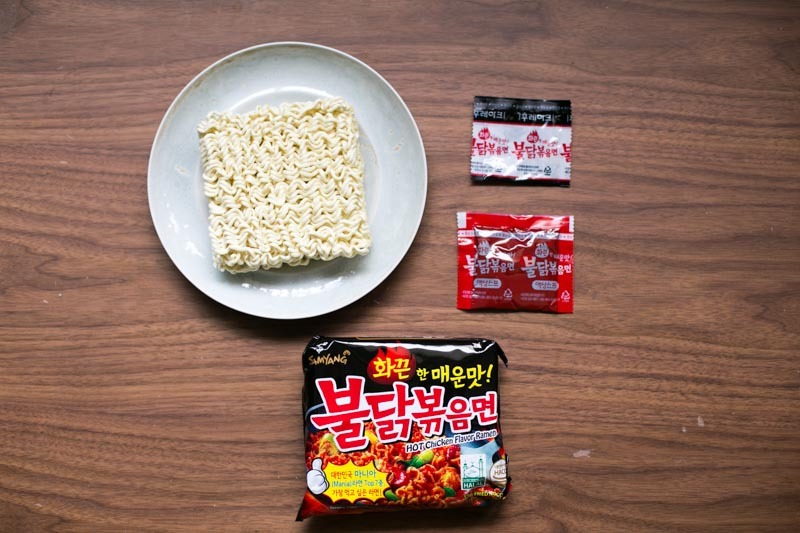 I’d say it actually takes the ‘instant’ out of ‘instant noodles’. After boiling the noodles, we let it sit in an ice bath for about three to four minutes, waiting for it to drop to the ideal temperature. 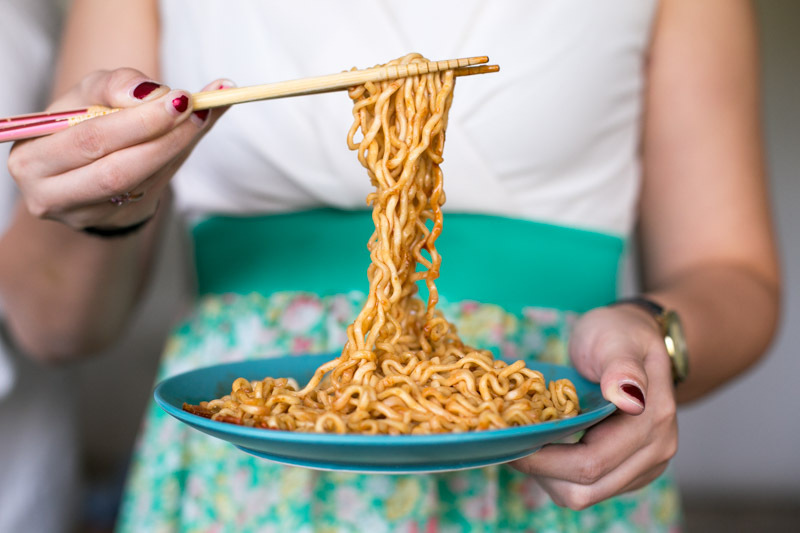 I also noticed that the noodles were thinner than usual, but I wonder why? We then mixed it with the spicy sauce and took a bite. 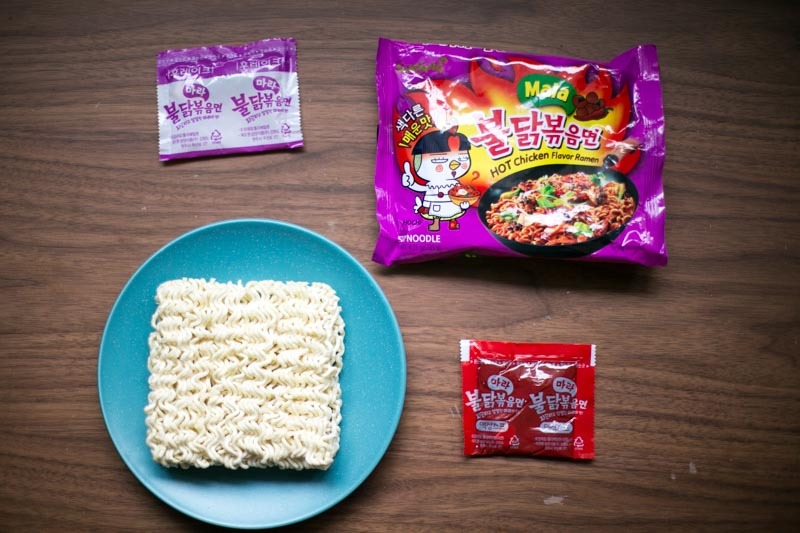 I was disappointed that it didn’t boast any unique flavour on its own, and tasted more like a generic plate of spicy noodles. Also, eating spicy noodles cold kinda confused my taste buds a little, and this lacked the hot kick that I love. Overall, I would say this was my least favourite flavour. Ah, Carbonara Hot Chicken Flavour ($7.90), the queen of my heart. The Carbonara was the second latest to hit Singapore’s shores and has very quickly earned a fan base. 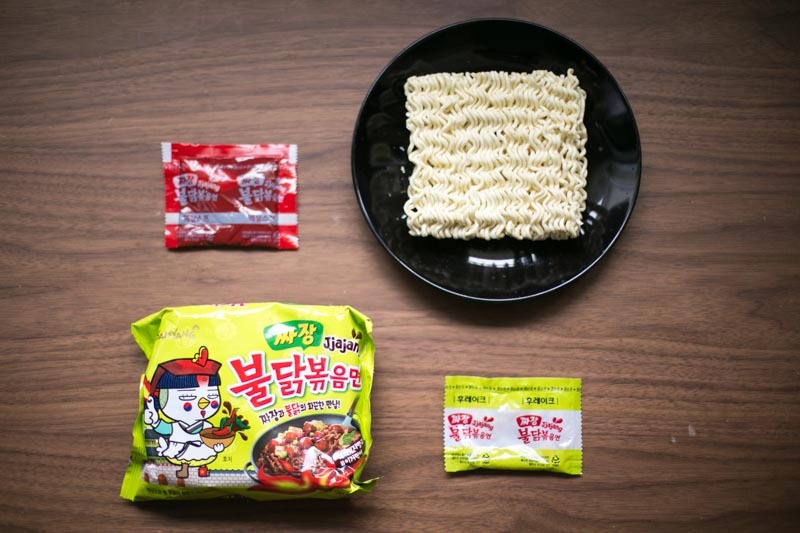 Ever since I first tried it back when it was just released, I’ve been in love with this flavour, and I even constantly have a few packets stocked up at home for when I get hungry at 2am. 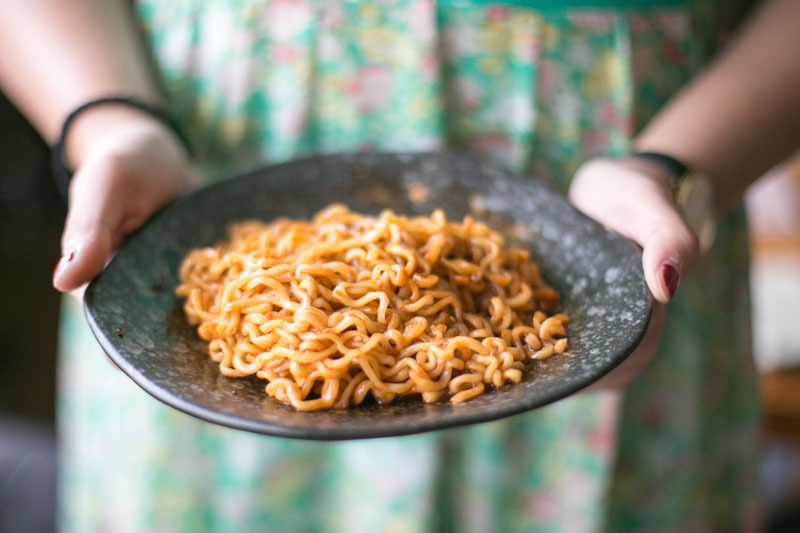 You’d also notice that the make of the noodles are flatter and thicker than the usual Samyang noodles, perhaps to emulate the texture of linguine? As a result, it was also chewier than the other noodles. What I particularly love about the Carbonara is the subtle creamy flavour that’s balanced out by the spicy sauce. Though it definitely didn’t taste like the actual egg-based Carbonara sauce, it was pretty special in its own way. I mean, if cream and chilli isn’t the best of both worlds, I don’t know what is. 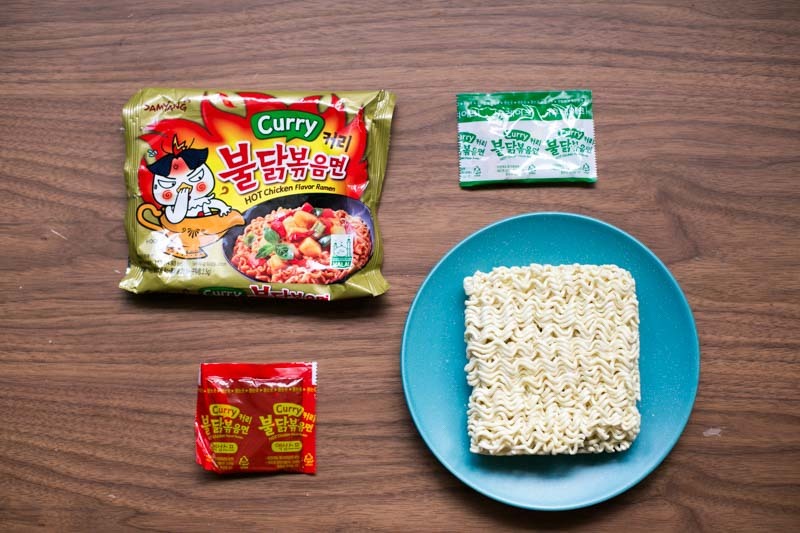 If you love Japanese curry, then you’ll dig the Samyang Curry Flavour Ramen ($6.90). The noodles came with curry sauce and a small packet of dried vegetables. The curry had a hint of sweetness and a whole lot of spice. The consensus was that it was pretty yummy overall, but not really my jam because I prefer my curries savoury. This flavour would do well with chicken wings on the side, if you’re looking to fancy-up your budget meal. 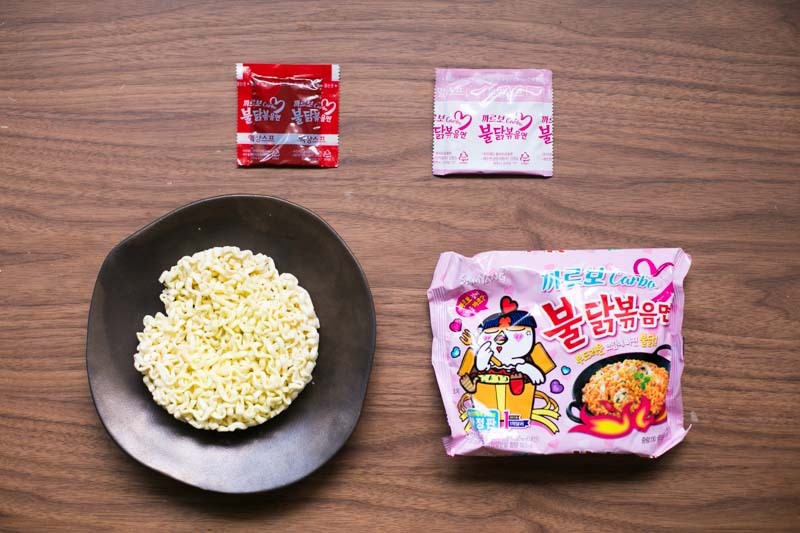 The mala craze is still going strong, and now you can get instant Samyang Mala Flavour Ramen ($8.30) to satisfy your cravings any time, anywhere (okay almost anywhere, as long as you’ve got hot water and a pot). The packet came with little dried vegetable pieces too, but as most of them are, they were a little pathetic and frankly not nutritional at all. The Mala flavours were brought out quite well though, and tasted almost like the real deal. I’d recommend you add your own ingredients such as luncheon meat and vegetables to replicate the true Mala experience. 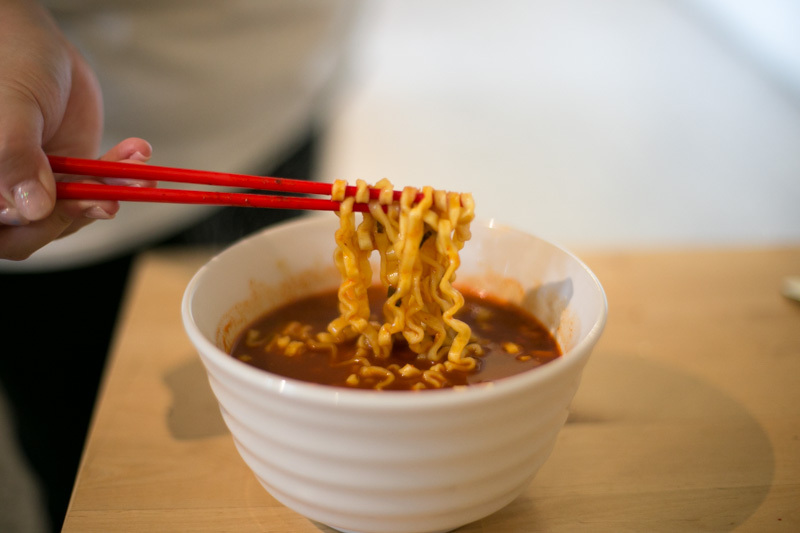 The Cheese Hot Chicken Flavour Ramen ($6.90) used to be my favourite flavour, but has since been replaced by the two aforementioned newer ones. The cheese came in the form of powder, and is meant to be mixed with the spicy sauce to form a sort of creamy consistency. A colleague commented that the cheese had sort of an artificial flavour, which kinda turned her off. I personally didn’t find that too overwhelming, but you should go check it out for yourself and be the judge. 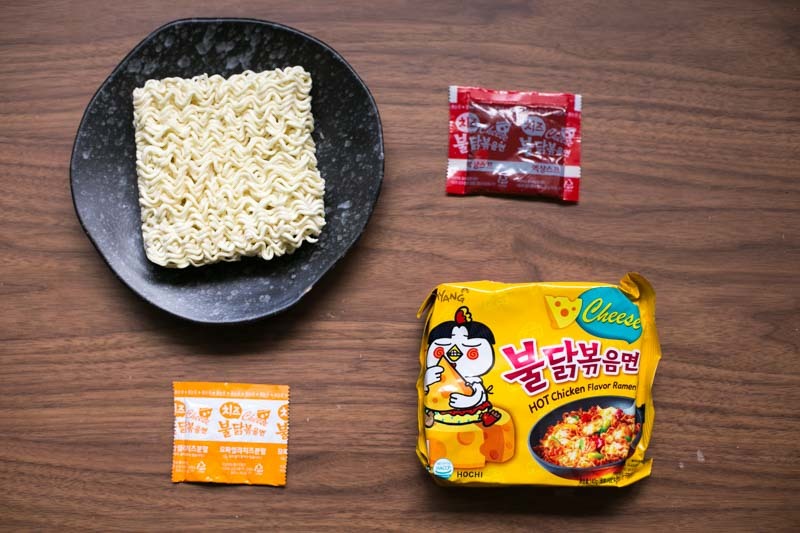 Out of all the Samyang flavours, the Stew Type Hot Chicken Flavour Ramen ($7.50) was the only one meant to be cooked as a soup. 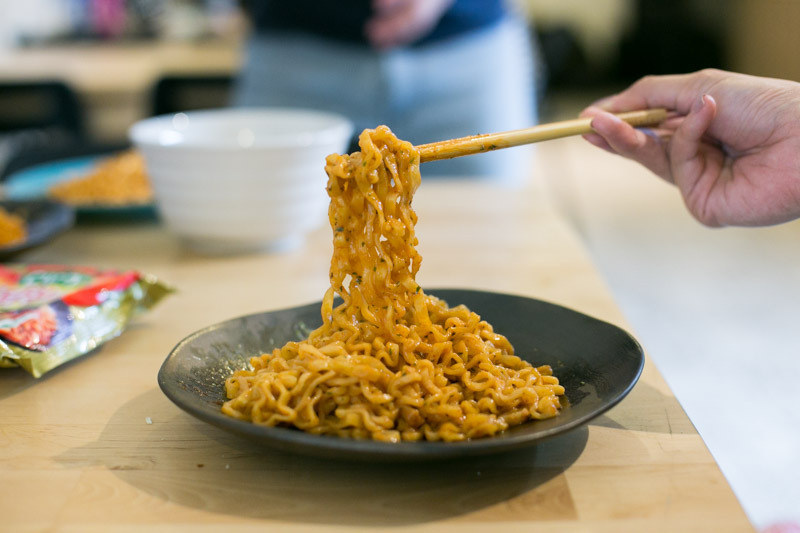 You’ll also notice that the type of noodle for this flavour is actually the same as the ones used in the Carbonara flavour. We first cooked the stew base and threw in the noodles when the soup started to bubble. Its fragrance wafted through the air as we waited eagerly in anticipation to get our first taste. Turns out, it smelled nicer than it tasted. The spicy soup carried a subtle sweetness, but was otherwise quite flat in terms of its flavour profile. 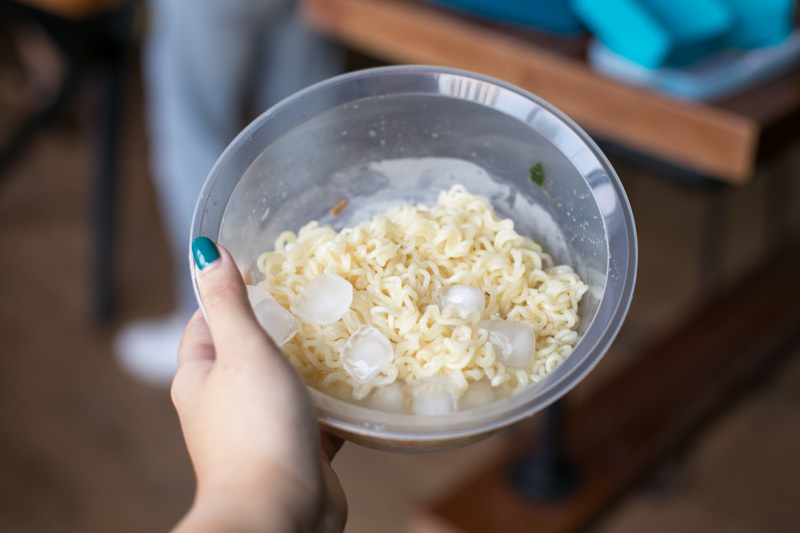 It’s probably the kind of noodle soup that you take five bites, tops, before tossing the rest of the bowl due to the cloying feeling. Nothing much to rave about, in my opinion. 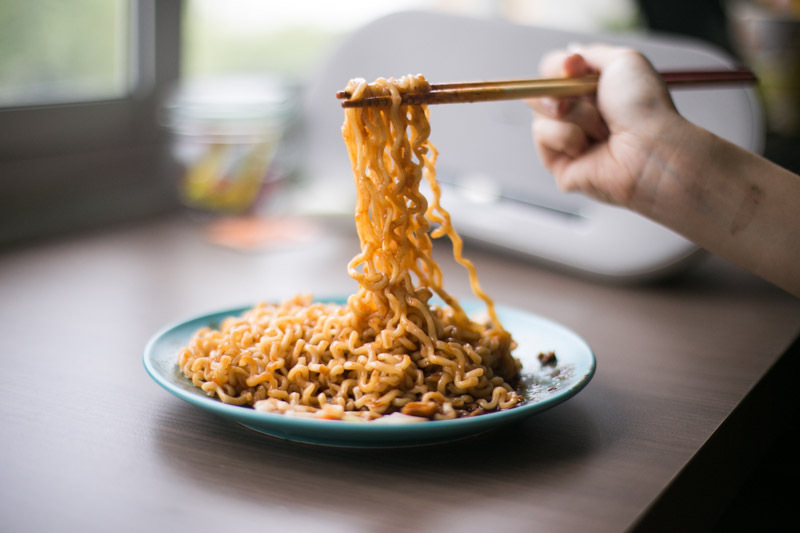 Instant noodles has always been a guilty pleasure of mine, and so I’d jump at any opportunity to give new flavours a try. 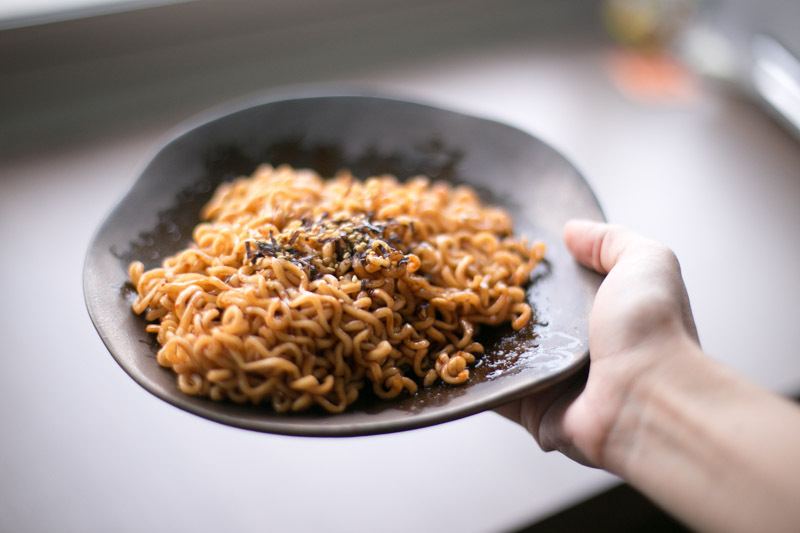 Samyang has too, been a go-to for me whenever I need to satisfy my spicy noodle cravings but I’ll stand by the Carbonara and Jja Jang Myeon as two of my favourites from the brand. 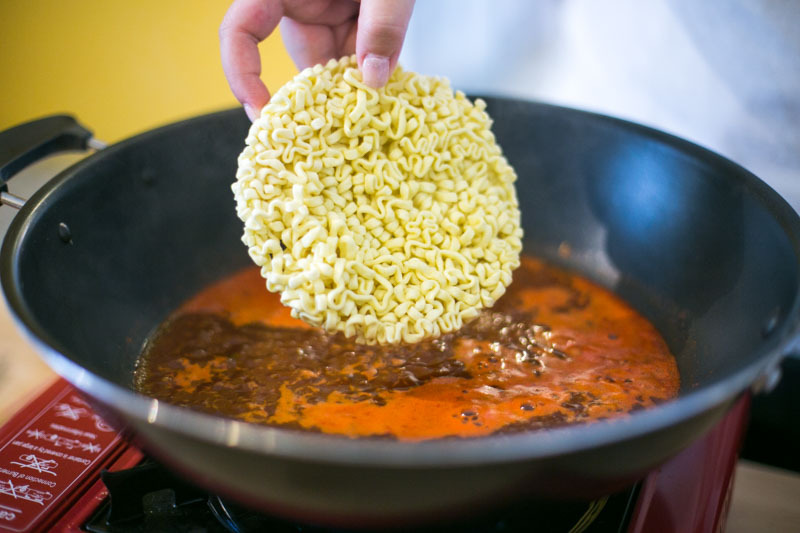 So the next time someone asks you to send noods, you know what to do. When she's not hustling away at school, Vera spends her time petting cats, taking photos and singing with her A Cappella group, The Rolling Tones.